It’s almost Thanksgiving and I’m busy in the kitchen baking pies for my family and friends. For Dad, I’m baking his favorite pie with a twist: Maple Pecan Pie (adapted slightly from Closet Cooking). I’ll post about it once I hear back from him how he likes it. The other pie is actually a first for me. I’ve never made a cream-type pie before but German Chocolate Pie was requested from me, so it’ll be an adventure. I’ll be posting about both pies next week once Thanksgiving is over. Right now is the time to try this great, buttery squash as acorn squash and its close cousins are popping up on sale everywhere. 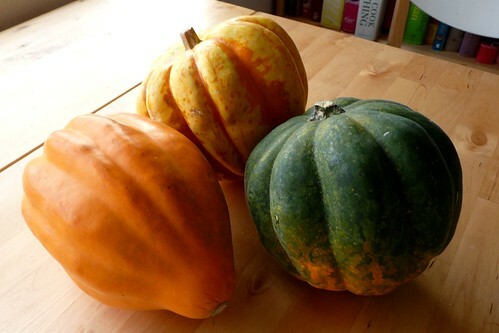 I recently picked up a few green acorn squash for the incredibly cheap price of 48c each! 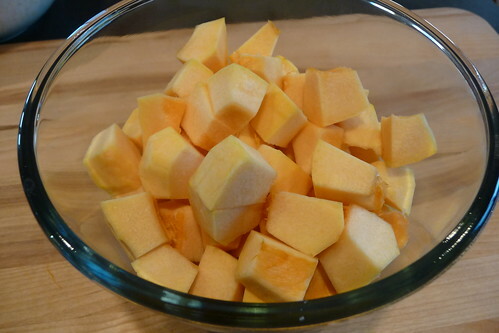 Considering one squash makes enough for four, this is only 12c per person of squash. They also seem to keep for a long time in a cool, dry place, so I stocked up. It’s possible to freeze them raw, but I’ve found they don’t last very long before the texture begins to change – about two weeks or so. It’s better to keep the squash whole in the pantry or root cellar. Mix together in a microwave-safe bowl. Cover and heat on high for 5 – 7 minutes until tender.